Geoinformatics FCE CTU is an open access journal focused on science and technology related to geospatial information ranging from geodesy, surveying, geographic information systems, cartography and mapping, photogrammetry, laser scanning, cadastre and other related engineering fields; last but not least the journal focuses on promoting Free Software. 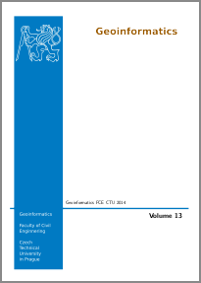 The Geoinformatics FCE CTU (Faculty of Civil Engineering, Czech Technical University in Prague) was founded in 2006 as an open access journal. Formerly it was hosted on a mediawiki with articles converted to LaTeX and volumes published in PDF. The articles used to be submitted and reviewed openly on the mediawiki until 2011, when double blind review process was adopted and volumes were published directly from LaTeX sources (or exceptionally from MS Word documents). Since 2015 the journal is published by the Czech Technical University (CTU) in Prague and hosted on a management and publishing system Open Journal Systems (OJS). From 2015 all new articles are licensed under CC BY 3.0. Geoinformatics FCE CTU is indexed by crosreff.org database and all articles have DOIs assigned (Digital Object Identifier). See also CTU Open Journal Systems.